As a follow-up to my last post, I wanted to share the other batch of cupcakes I made for Landon’s baptism. Lately, I’ve done a lot of experiments using browned butter: Browned Butter Fruit Upside-Down Cake, Browned Butter Yogurt Cake, and Browned Butter Golden Cupcakes. In the cupcake arena, I’ve been substituting regular unsalted butter with browned butter to my tried-and-tested cupcake recipes. I brown regular butter in a medium saucepan and let it melt and slightly bubble up until golden brown in color. In some recipes, I use up all the browned butter including the slightly burned milk solids. In certain recipes, these milk solids can be strained before letting the butter solidify again. In Nigella Lawson‘s How To Be A Domestic Goddess, she has a beautiful chapter on cupcakes, or what she calls Fairy Cakes. Her cupcakes are NORMAL-sized dressed with royal icing, which I kinda like, not the gargantuan cupcakes we are accustomed to seeing in bakeries. Don’t get me wrong, I love jumbo cupcakes mounted with almost a full cup of frosting too. I mean who can resist delicious frosting atop a moist cupcake. Anyway, Nigella had a recipe for Burnt-Butter Brown-Sugar Cupcakes which she makes in a food processor. I made the cupcakes with slight adaptation using my beat-up yet very reliable Kitchen-Aid mixer. Adapted from Nigella Lawson’s Burnt-Butter Brown-Sugar Cupcakes on How To Be A Domestic Goddess. I changed the method of making the cupcakes and I paired it with a light Mascarpone-Cream Cheese Frosting instead of Nigella’s version of topping the cupcakes with Browned Butter Frosting. Makes 12 cupcakes. 1. Preheat the oven to 400°F. Prepare one standard-sized muffin pan and line with cupcake liners. Heat the butter in a medium saucepan and brown over medium heat until dark golden in color. Stir often while browning. 2. Take the pan off the heat and strain the browned butter into a small container to remove milk solids. Let the butter solidify slightly. You want room-temperature or softened butter consistency for creaming – not too firm, not too runny. Meanwhile, sift the cake flour and baking powder into a medium bowl (or if you are like me, I sift it over parchment paper). 3. When the butter is ready, cream it with the two sugars in an electric mixer. Add the eggs one at a time, mixing well before each addition. Scrape down bowl as necessary. Add the vanilla extract and combine. 4. Alternately add the dry ingredients and the milk into the creamed butter, making sure to start and end with the flour. Do not overmix, just beat to combine or finish mixing by hand with a spatula (I prefer to finish mixing by hand to make sure that the batter is not overmixed). 5. Divide batter equally among the paper cups. It may look like you don’t have enough batter, but just try to properly divide and use up all the batter you have in the bowl. Bake the cupcakes for 15 to 18 minutes until golden brown and a toothpick comes out clean when inserted in the center of a cupcake. Check during the twelfth minute or so of baking. Since the batter is very little, you want to make sure you don’t overbake these cupcakes either. Let cool in the pan for 5 minutes and then transfer to a wire rack to cool completely. Don’t expect this frosting to be uber-sweet and rich. This is very light (like whipped cream) and not overwhelmingly sweet. Makes enough to frost 12 cupcakes. 1. Beat room temperature mascarpone cheese and cream cheese into the bowl of an electric mixer on medium speed. Add in confectioners’ sugar gradually. 2. Add the heavy cream and beat until combined and cream gets incorporated, no more than one minute. You are beating the cream in for about 30 seconds to a minute to give it time to form into soft peaks within the mixture. 3. Transfer the frosting into a piping bag to pipe on top of cupcakes or use an offset spatula to spread frosting on top of cupcakes. These cupcakes are beautiful! I like browned butter. That nutty smell and taste. 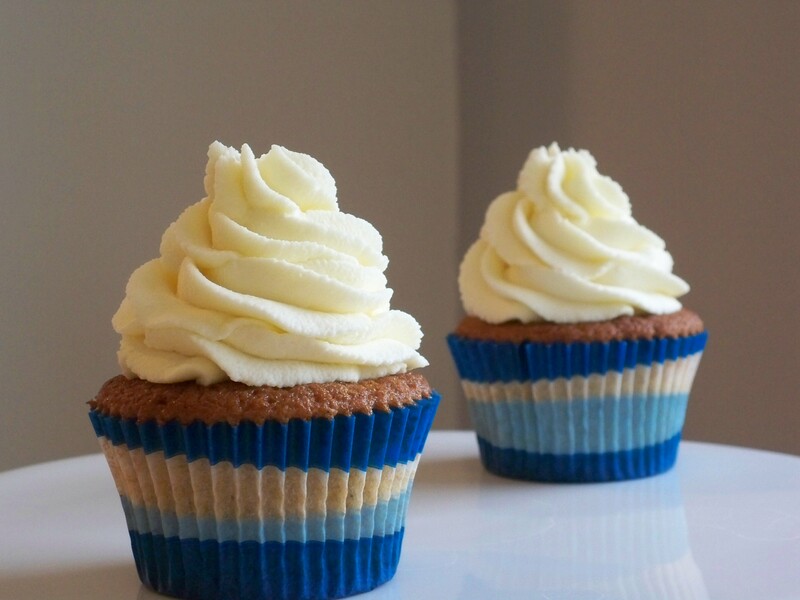 Those are darling cupcake liners and the mascarpone cream cheese frosting looks so perfect. Thank you Cristina. I absolutely adore browned butter. I used up all these blue cupcake liners for my nephew’s baptism… I have to order another box to keep in my stash. 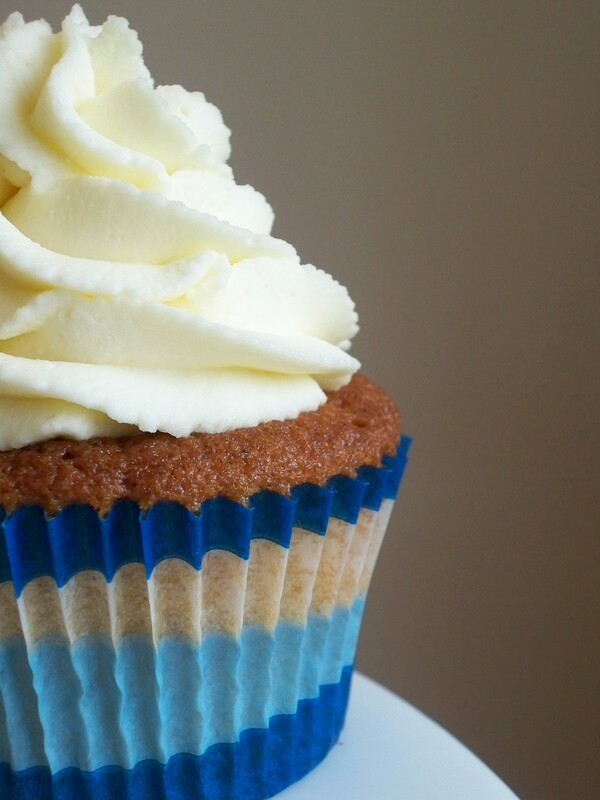 I usually don’t like frosting, but I think I could manage this one:) Looks great! Hi there Maria. Thank you for the note. Why do you say you usually don’t like frosting? I know there are plenty out there that’s incredibly sweet, you feel like your teeth would fall off. Haha! hi kathy! it was a pleasure meeting you at hong & kim’s party. you have some delicious treats on your blog! we’ll have to put you on our blogroll so we can keep up with all your yummy baking posts. 🙂 hope to see you around again! take care. Hi, these cupcakes look really good! 🙂 I’d like to try making them, but I’m a little doubtful about the temperature..isn’t that too high for cupcakes? Hi Ophelia! Thank you. They are really yum actually. Everyone loved it at the baptism party. Great observation… I thought the same thing too when I adapted the recipe from Nigella Lawson’s book. Nigella actually bakes it for 20 minutes, which I thought was too long. That’s why I baked mine for about 16-17 minutes. You can lower the temperature to 375 degrees and I would suggest to still bake it no longer than 20 minutes. Just watch for visual clues to really see that it’s done, yet not overbaked. Great pics. I like your mobile version. These cupcakes are delicious! 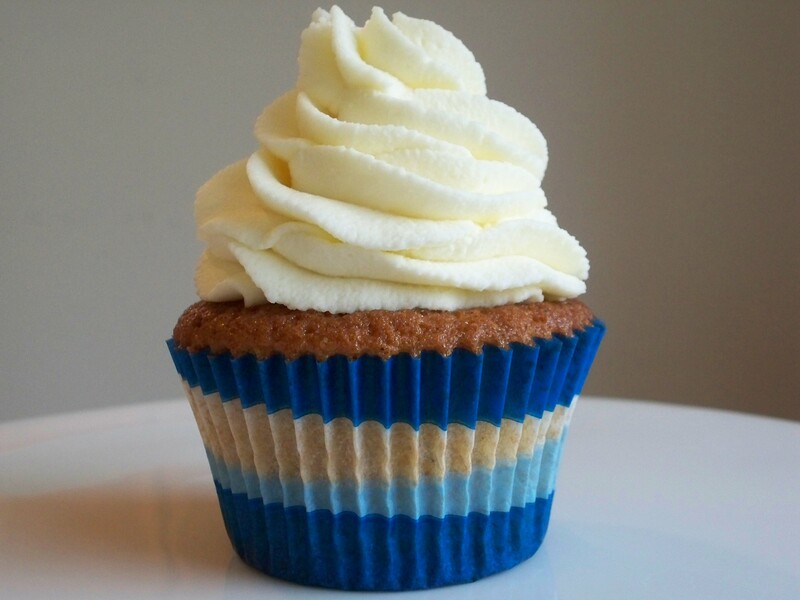 I love using marscapone cheese in frosting and it pairs perfectly with this yummy, moist cupcake! Me too. Mascarpone is a killer ingredient on sweet items when used properly. Thanks Stacy!